Thank you for visiting the Pets Pantry web site, www.petspantry.com. Please read them carefully. Your use of our web site indicates your acceptance of these terms and conditions. Your placement of an order also indicates your acceptance of these terms and conditions. All orders placed via this website are carried out in good faith, and are considered a promise to buy. All information you supply during the ordering process is considered true and correct. All information contained on the Pets Pantry web site implies no warranty whatsoever. Information and statements are not intended to diagnose, treat, cure, or prevent any animal disease or ailment. No warranty is made that any information on or linked to the Pets Pantry web site is complete and/or accurate. All information contained on the Pets Pantry web site is for informational purposes only. The information contained on this site is not intended nor is it implied to be a substitute for professional veterinary advice or any information contained on or in any product packaging or labels. It is possible that any animal may experience an adverse reaction to a particular product purchased from this website. Pets Pantry recommends that you consult a veterinary surgeon before using products advertised on this website. Not all products have had their claims tested or are registered in all countries. The claims or product registrations relate to the country of origin only. These products are Australian, they are sold within Australia and are subject to Australian law. Some packaging and labeling may differ from that in other countries. Pets Pantry strongly recommend you check with local authorities if you are unsure about any product. This site is owned and operated by Pets Pantry Trading Pty Ltd hereafter known as Pets Pantry. Unless otherwise specified, all material appearing on this site, including the text, site design, logos, graphics, icons and images, photographs, graphics, typefaces and other material (collectively referred to as "Content") as well as the selection, assembly and arrangement thereof is subject to applicable copyright laws. Copyright © 2007, ALL RIGHTS RESERVED. You may use the content of this site only for the purpose of shopping on this site or placing an order on this site and for no other purpose. No materials from this site may be copied, reproduced, modified, republished, uploaded, posted, transmitted, or distributed in any form or by any means without Pets Pantry’s prior written permission. All rights not expressly granted herein are reserved. Any unauthorised use of the materials appearing on this site may violate copyright, trade mark and other applicable laws and could result in criminal or civil penalties. By using this site you agree that doing so is at your own risk. In no event will Pets Pantry, its directors, officers, employees and representatives, third-party content providers or the like warrant that the site will be uninterrupted or error-free. In addition Pets Pantry do not make any warranty as to the results that may be attained from the use of the site, or use of the information or products provided through the site. If, when using the Site you provide any information that is untrue, inaccurate, not current or incomplete, or we have reasonable grounds to suspect that such information is untrue, inaccurate, not current or incomplete, we may suspend or terminate your registration and refuse any and all current and future use of the Site. You are responsible for maintaining the confidentiality of your password and registered account and are fully responsible for all activities that occur under your password and registered account. Prices listed on our web site include all relevant taxes including G.S.T (Australian Goods & Services Tax), but do not include shipping costs. Shipping Costs are added as the customer proceeds through to checkout, and are clearly visible before any customer payment details are requested. Any import duties, customs duties or restrictions incurred by International customers are the responsibility of the customer and are beyond the control of Pets Pantry. International customers are advised to check with the relevant authorities in their country before placing an order with Pets Pantry. Any orders sent overseas delayed in customs must be dealt with by the purchaser residing in the relevant country, and any fees or charges incurred through customs are the responsibility of the purchaser. In the event a product is listed at an incorrect price due to a typographical error or error in pricing information received from our suppliers, Pets Pantry shall have the right to refuse or cancel any orders placed for products listed at the incorrect price. Pets Pantry shall have the right to refuse or cancel any such orders whether or not the order has been confirmed and your credit card, debit card of Paypal account has been charged. If your credit card, debit card or Paypal account has already been charged for the purchase and your order is cancelled Pets Pantry shall immediately issue a credit to your credit card, debit card or Paypal account in the amount of the incorrect price. We accept Visa & MasterCard. There is no surcharge for using Visa & Mastercard to make purchases on the Pets Pantry web site. Please be sure to provide your exact billing address and telephone number. Incorrect information may cause a delay in processing your order. Credit card transactions are billed by Verisign. Verisign is a leading Secure Sockets Layer (SSL) Certificate Authority who enable secure e-commerce on our web site. Verisign provide a critical layer of intelligence and security that protects your credit card information. Payments via Verisign will not be considered finalised until Pets Pantry receives an official payment statement from Verisign. This usually takes one but occasionally up to two days. We accept Paypal as a method of payment. There is a 2.5% surcharge for using Paypal to make purchases on the Pets Pantry web site. Purchases using Paypal as the method of payment are also subject to the terms & conditions of use as determined and issued by Paypal. Payments via Paypal will not be considered finalised until Pets Pantry receives an official payment statement from Paypal. This usually takes one but occasionally up to two days. Pets Pantry accepts payment via direct debit in $AUD only. Please email us on orders@petspantry.com or call us on 1300 30 40 34 for our bank account details. Orders are processed upon receipt of payment. Please allow up to 2 banking days after receipt for clearance of funds before the order will be processed. Pets Pantry accepts money orders, bank cheques, personal cheques and company cheques in $AUD only. Please email us on orders@petspantry.com or call us on 1300 30 40 34. Orders are processed upon receipt of the money order or bank cheque. For personal and company cheques, please allow up to 10 banking days after receipt for clearance of funds before the order will be processed. Pets Pantry cannot guarantee the availability of a product by the time funds clear or payment is received. We will charge a $20 fee on all returned cheques. All cheques/money orders should be made payable to Pets Pantry Trading Pty Ltd and posted along with a copy of your order to Pets Pantry, 7 Hartley Court Rosanna Vic 3084. We accept payment on delivery ONLY in the Melbourne Metropolitan area. The only type of payment acceptable via this method is Cash. Delivery will not be made unless our delivery driver has received payment for the goods in full. We reserve the right to charge a re-delivery fee of AUD$10 or 15% (whichever is the greater) should we not be able to collect payment on delivery. 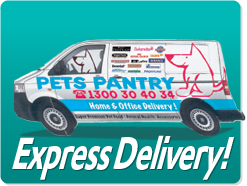 Goods purchased on the Pets Pantry website will be delivered by either a Pets Pantry employee, private courier or Australia Post. The delivery area is limited to those areas serviced by Australia Post. We reserve the right to utilise alternative forms of transport at our discretion. The delivery time for each order is based on the availability of the Product(s) + Shipping time. Shipping times reflect the distance the parcel travels and the remoteness of the location. Capital cities within Australia can expect delivery within two to five working days, remote locations up to 14 working days & Overseas up to 3 weeks. The maximum time allowance for delivery is 5 weeks, depending on stock availability. In the case where multiple products are ordered together, the order will not be shipped until all the products ordered are available from our warehouse. In circumstances where a particular product will be delayed for a lengthy time, Pets Pantry will endeavour to advise the customer of the situation and make any arrangements or adjustments necessary. Unless indicated otherwise Pets Pantry assume that permission is granted to leave goods at unattended premises. Pets Pantry will accept no liability for goods delivered that are subsequently damaged, lost or stolen from unattended premises. If delivered by a Pets Pantry employee we reserve the right to charge a re-delivery fee of AUD$10 or 15% (whichever is the greater) if we are unable to deliver to an unattended premise for any reason. If delivered by courier we reserve the right to pass on the cost of the re-delivery charged to us should our courier be unable to deliver to an unattended premise for any reason. You may sometimes have special requirements for the delivery of your order. Any comments that you would like to include can be recorded in the 'Payment Details' section of the checkout process. We encourage all customers to provide detailed delivery instructions. Your receipt of an electronic or other form of order confirmation does not signify our acceptance of your order, nor does it constitute confirmation of our offer to sell. Pets Pantry reserves the right at any time after receipt of your order to accept or decline your order for any reason. Pets Pantry reserves the right at any time after receipt of your order, without prior notice to you, to supply less than the quantity you ordered of any item. We may require additional verifications or information before accepting any order. Upon receipt of an order the customer is required to visually check the consignment for signs of damage. In cases where the consignment is damaged in transit, the customer must contact us as soon as possible. Before opening any product bags or boxes, please check that you have been sent the correct product. Pets Pantry offer a 7 day Money Back Guarantee (less shipping costs) provided the goods are returned in a saleable condition and are unused, in the original undamaged box including all original packing and inclusions. We reserve the right to charge a restocking fee of AUD$10 or 15% (whichever is the greater) and replacement cost, or refuse the return of items that are returned incomplete or damaged in any way. The purchaser is required to pay all shipping costs incurred in returning items to Pets Pantry except in instances where the goods arrived faulty or the incorrect product was shipped by Pets Pantry. To arrange for the return of any item please email us at orders@petspantry.com (quoting your invoice number) or contact us by phone on 1300 30 40 34 to obtain our return shipping address. No responsibility will be taken for goods returned without an invoice number. We will only accept returns where contact is made within 7 days of receipt of the item from Pets Pantry. All goods returned to Pets Pantry will be inspected upon their return and in the case of faulty products, a replacement product will be sent at the expense of Pets Pantry or a refund issued to the customers credit card, debit card or Paypal account according to the customers instructions. In the case of non-faulty goods returned to Pets Pantry, we reserve the right to deduct the standard restocking fee from any refund issued, or to return the goods to the customer at the customer’s expense. Your order can be changed or cancelled at any time before your order is shipped. Once the order has been placed you can cancel your order by sending a request to cancel to orders@petspantry.com or calling us on 1300 30 40 34. We can only cancel orders that have not been shipped. If you have submitted an order in error or changed your mind after your order is in the shipping process, we will accept returns. Refer to our Return Policy & Procedure above for details. If your product is lost during shipment, we will do our best to replace your product as soon as possible (depending upon product availability). In order to confirm that an order has been lost, we may wait until the maximum delivery time of 5 weeks has expired before replacing your order. The purchaser is required to pay all shipping costs incurred in re-sending goods. Pets Pantry offers no warranty on products above that which is offered by the relevant manufacturer. Title for all goods dispatched remains with Pets Pantry until payment has been received in full. Until title passes, Pets Pantry can retain, repossess and/or resell all goods. Customers acknowledge that they hold all goods from Pets Pantry as bailees until title passes. As far as legally possible this Agreement, its terms and conditions and the use of the Pets Pantry web site shall be governed by the laws in existence from time to time in Australia. Any claim relating to Pets Pantry, the services provided through the Pets Pantry web site or the Content shall be governed by the laws of the state of Victoria and you agree to submit to having the matter dealt with in a court in Melbourne in the state of Victoria, Australia. These terms are effective even if this Agreement is terminated by either party. Subject to applicable law, we reserve the right to suspend or deny, in our sole discretion, your access to all or any portion of the Pets Pantry web site with or without notice. You agree that any termination of your access to the Pets Pantry web site may be effected without prior notice, and acknowledge and agree that we may immediately deactivate or delete your registration and all related information and files under your registration and bar any further access to such files or the web site. Further, you agree that we shall not be liable to you or any third-party for any termination of your access to the site.